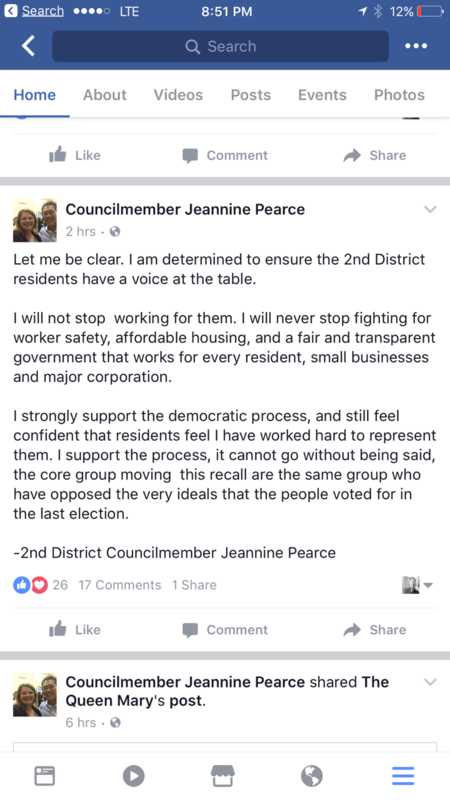 The Committee to Recall Councilmember Jeannine Pearce – Restore Accountability in the 2nd District! OUR SIGNATURES WERE TURNED IN TO THE LONG BEACH CITY CLERK MAY 9TH — THANK YOU TO ALL OUR SUPPORTERS WHO MADE THIS POSSIBLE! 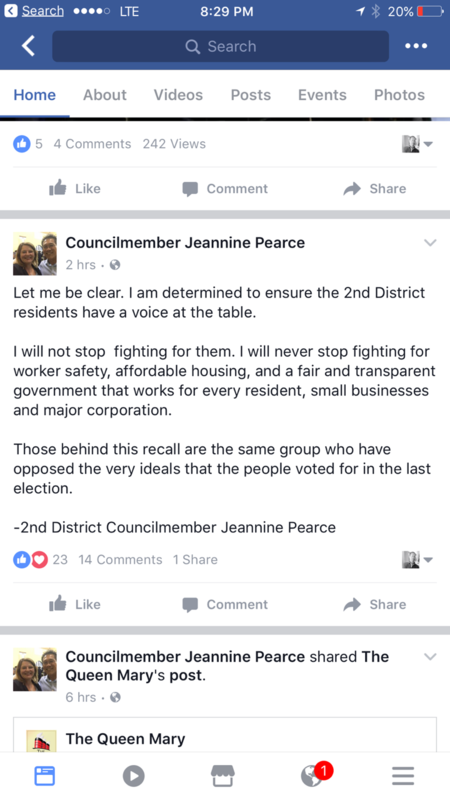 Councilmember Pearce refused to speak to the media yesterday, who sought comment in response to the formation of our recall committee. She finally responded on her official facebook page later in the evening, safely away from reporters’ questions. She revised her response multiple times. Judge for yourself if Councilmember Pearce’s pretty incoherent, shifting, non-explanatory responses suggest that she is coming a bit unhinged. And note that she DOES NOT DENY a single charge made in our press release. Speaking of incoherence? Is she saying in that last revise she supports the recall while opposing the recallers?? And she paints us with the broad brush of opposition to her agenda, but what agenda would that be, given her insignificant role on the City Council to date? The Committee Supporting the Recall of Councilmember Jeannine Pearce respectfully requests a correction and the opportunity to respond. That is, in fact, only one possible approximation of the cost, and not the most likely. Indeed, Long Beach City Clerk Monique DeLaGarza told me, in person, in her office (the same day I submitted our paperwork, last Friday), that there was absolutely no way to predict, at this stage, what the cost to the City of the Recall would be. 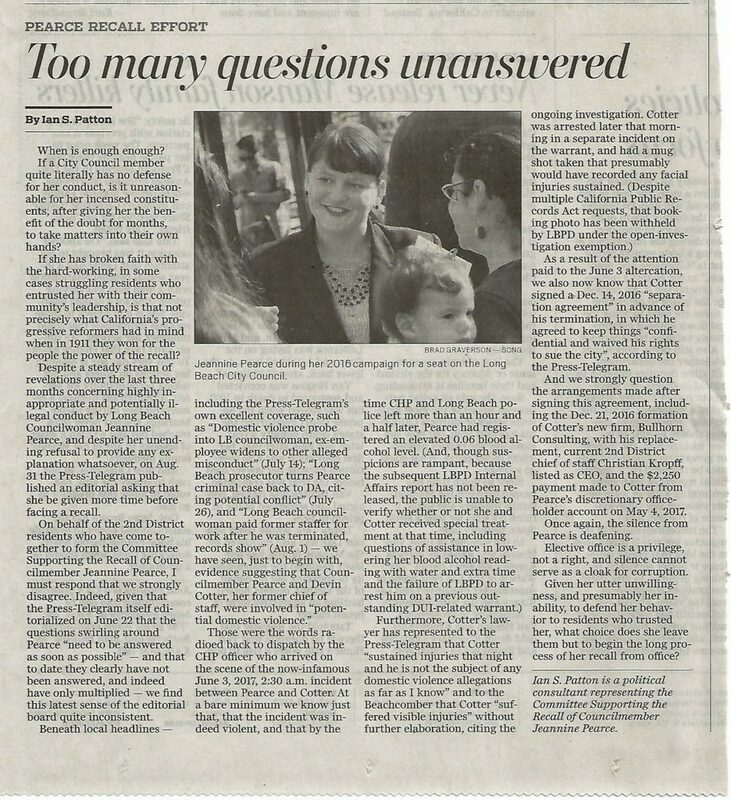 I asked her to make this clear to the press should they call her back on the matter of special election costs, and she said she would be more than willing to do so. 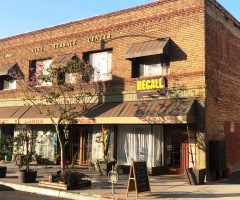 The potential total cost actually ranges from a number close to $0 all the way up to approximately $500,000, depending entirely on timing (which may be partly in the hands of the Recall Committee itself, depending on when it has sufficient signatures gathered and when it decides to submit them for validation to the City Clerk’s office) and depending on whether the special elections for the Recall Election and for the Replacement Election end up being consolidated, respectively, with the 2018 April and June regularly scheduled elections (as you are aware, the LB City Charter dictates that these be two separate elections, the latter following the vacancy created by the former). And in the case of the June election cost factor, it would further be affected by whether Long Beach has any municipal run offs or not (this is due to the fact that the June election will be run by the LA Co. Registrar’s office, and may or may not already have a Long Beach municipal election portion planned for the ballot). The Editorial Board implied by its wording that the figure was simply upwards of $500,000 without accurately stating the range of likely possibilities, which again could very possibly be close to $0. 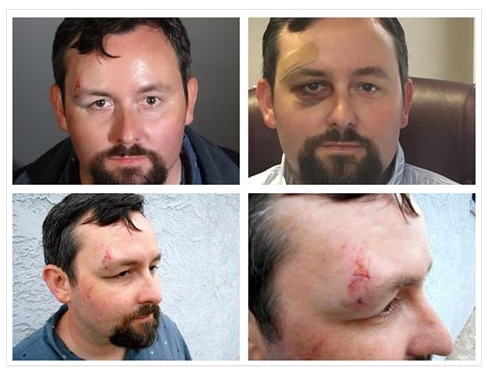 We feel this to be highly misleading to the public, and we ask for an appropriate correction. We feel this is particularly important given that the overall argument of the editorial rested, in part, on cost. Of course, we also strongly disagree that the Recall is “premature”, and in response to that argument put forth by the Board we request the opportunity to provide a published response. 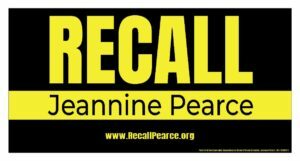 Indeed, it is reporting in the Press-Telegram which, in large part — combined with the total silence and stonewalling on the part of Councilmember Pearce and the City — has dictated the necessity for this Recall signature gathering campaign. 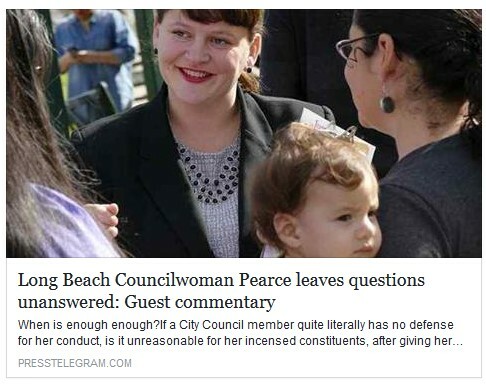 Based on all the reporting in the PT and elsewhere, it is hard to imagine any explanation by Pearce, for all the charges we assembled from public reporting — and for which the logic and factual basis remain unquestioned and for which, to date, Councilmember Pearce has made no denials whatsoever — that could reasonably be given unaccompanied by a statement of resignation. 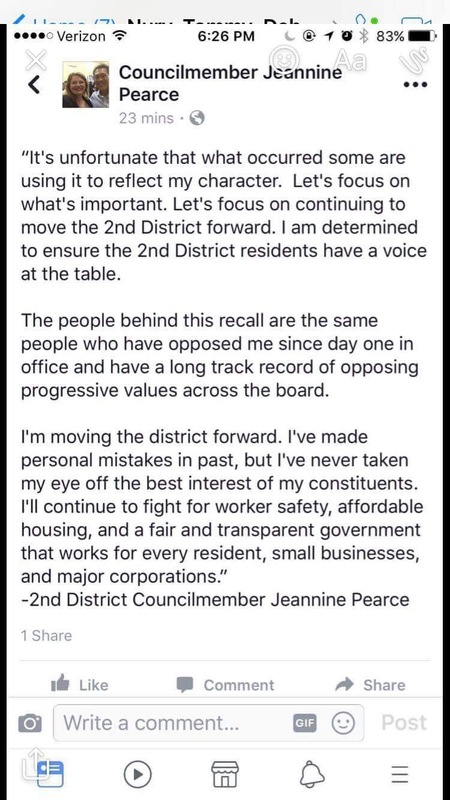 In fact, our position has been, since formation of this Committee last Friday, that the least burdensome (to the 2nd District, in particular) and least costly to the City outcome would be for Councilmember Pearce simply to recognize the gravity of her unexplained (and politically unexplainable) inappropriate, unethical, and likely illegal behavior and to resign. 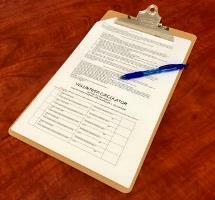 Resignation only costs the City ink and a piece of paper. And it would save the City the embarrassment and distraction of Pearce’s continued criminal investigations, as well as likely further revelations of chaos in her life spilling over from the personal to the professional/official.